Lutz Lampe, Assistant Professor, Department of Electrical and Computer Engineering, University of British Columbia, Canada. Dr Lampe received his Ph.D. in electrical engineering from the University of Erlangen, Germany, in 2002. He was promoted to Associate Professor in 2007 and Professor in 2010. His main research interests lie in the areas of communications and information theory applied to wireless and power-line transmission. Dr. Lampe was awarded the prestigious UBC Killam Research Prize in 2008. He is an Editor for the IEEE Transactions on Wireless Communications, and an Editor for the International Journal on Electronics and Communications. 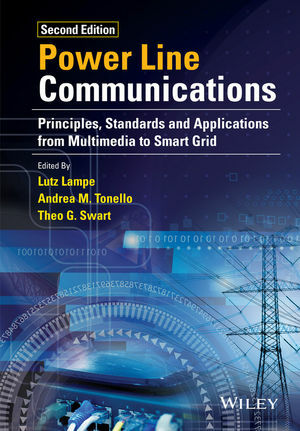 Andrea Tonello, Professor, Wireless and Power Line Communications Laboratory, Department of Electrical, Mechanical and Management Engineering, Università di Udine, Italy. Dr Tonello received the doctor of enginering degree in electronics and the doctor of research degree in telecommunications from the University of Padova. His research activity focuses on wireless and power line communications with emphasis to PHY and MAC layers. The main research areas include Next generation wireless systems, Next Generation wireless systems, Power Line Communications, and Smart Grids. Theo G. Swart, University of Johannesburg, South Africa. Dr Swart received the D. Ing. degree in 2006 from the University of Johannesburg, South Africa. Since 2007, he has been employed as a Senior Researcher with the Telecommunications Research Group, University of Johannesburg. His research interests include digital communications, power-line communications, and error-correction coding.